Lupin The 3rd Part 2 was on Adult Swim a decade ago -- now Part 4 is here! Get ready for the long awaited return of Lupin and his gang; the English dubbed version is only available on Adult Swim. TMS Entertainment USA announces that the latest installment of the Lupin 3rd series, Lupin The 3rd Part 4, will launch on Adult Swim on Saturday, June 17th. It will appear in the weekly TOONAMI programming block. TMS Entertainment USA, Inc. is a subsidiary of TMS Entertainment Co., Ltd. (better known as TMS), one of the world's largest and most distinguished animation studios. TMS has won recognition from the international filmmaking community for its highly-acclaimed animation, pioneering techniques and proud commitment to quality. With a dedicated team of development, production and design executives, TMS's growing reputation is reflected by the versatility, artistry and originality of the programs the company has produced for international markets worldwide. Established in 1964, TMS has produced more than 100 features, and over 100 TV program series, with a total of 8,000 half hours for global distribution. TMS programs have attained worldwide recognition and TMS will continue to strive for excellence. 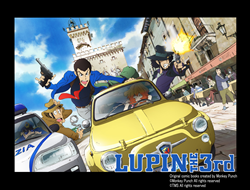 Lupin The 3rd is one of the most recognized animation TV series in Japanese history. It debuted as Manga comic in 1967 and started TV broadcasting in 1971. There are five TV series, totaling 267 episodes, including this newest LUPIN THE 3rd Part 4 (26 x 30-minute episodes). There are 26 feature length TV specials, and several theatrical films. The most recent film in theaters, “GOEMON ISHIKAWA” (2017), focuses on Goemon Ishikawa XIII, a master swordsman whose sword can cut anything.